The use of large, comprehensive collections of printed books and journals has seen a massive decline at North American research libraries in recent years—an effect of the shift in scholarly publishing from an analog and print-based model to a digital and networked one. However, during these past two decades of radical change and energetic response, I believe we have missed a much more important shift, one that poses a more direct and existential threat than the one posed by the move from print to online. We have failed to prepare for the emergence of a reality in which our very role as brokers, curators, and organizers has itself been fundamentally undermined. Intrigued? 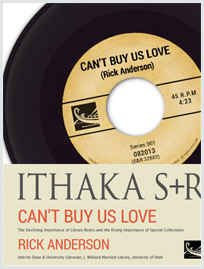 Download “Can’t Buy Us Love,” the first in a series of Issue Briefs from Ithaka S+R. Rick makes some very interesting points on the importance of special collections in academic libraries and their growing importance in the future. Unfortunately, special collections, as he points out, are understaffed and severely underbudgeted. If these collections are not discoverable for research then special collections are merely a warehouse for these rare materials - sad but true. I think this topic will continue to be at the forefront as academic libraries struggle to find what direction to take to remain relevant. This looks like a great discussion starter! Nail on the head, Rick. The answer to what will libraries become centers on what academic libraries have always been--and the answer is not collections. The real library is the body of knowledge brokers and teachers. Knowing how to find is much more significant than where to find, and is really the core element to libraries in the first place. Collections themselves are merely distillations that simplify the finding process. I just finished reading Anderson's issue brief. it is not the most articulate argument for the future of libraries, but it may be the best eulogy. I attempted to leave my response. But unfortunately, it ran longer than the comment word limit. Instead, I posted my comments to http://freegovinfo.info/node/3999.